For knowing afar off the evils that are brewing they are easily cured. But, when for want of such knowledge, they are allowed to grow until everyone can recognize them, there is no longer any remedy to be found. As Machiavelli counseled a long time ago, being anticipatory affords great advantage. What Machiavelli did not share, however, was the secret for how an organization develops more anticipatory prowess in order to gain strategic advantage. In a complex and rapidly changing society, being anticipatory and gaining strategic advantage requires sophisticated intelligence gathering techniques, new decision process models, and practical accountabilities. Collectively, these tools allow an organization to capitalize on strategic outside intelligence, avoid being blind-sided by external forces, profit from new opportunities, and to turn emerging threats into opportunities. Failure to anticipate can have destructive consequences. Significant examples of failures to anticipate dramatic outside shifts can be found at organizations with considerable internal resources. Major U.S. corporations such as IBM, GM, Sears, and CBS, just to name a few, all failed to anticipate dramatic external shifts. For example, for much of the 1980s, IBM ignored the signals that the computer industry was changing; although they made attempts to be a player in the PC business, they focused on the mainframe. GM failed to heed signals in the late 1960s of a potential energy crisis, or the increasing attractiveness of small, fuel efficient Japanese cars, particularly on the West coast, signals that were ignored until GM's market share skidded almost 30% in the U.S. Sears continued to fiddle with self-branded merchandise and monolithic department store and catalog delivery systems, while customers asked for name brand merchandise and for more quality in products and services. CNN preempted the networks in the 24 hour news category at a fraction of the cost CBS was paying for just one hour of nightly news. Given that change has become the essence of today's business climate, the real strategic consideration is whether change will befall your organization as a series of crises, or, will you be able to use foresight and anticipation to manage change in a calm, informed, and systematic manner? Setting one's future agenda can only be done with sophisticated intelligence techniques, new models, and practical accountabilities. To survive and prosper in the future, you will have to perfect your outside-in thinking skills by relating the information from a strategic intelligence system about developments in the external world to what is going on inside your organization. The purpose of this article is to describe anticipatory management tools, techniques, and processes that you can use to anticipate and shape your organization's future. The anticipatory management decision process model (Figure 1) suggests an outside-in intelligence flow chart that has been employed with great success in a variety of corporate settings. It is called a decision process model because it focuses on surfacing emerging issues and affords organizational leaders an opportunity to evaluate and make decisions vis-à-vis those issues in a timely manner based on the issues' seriousness and potential impact on the organization. The discussion below describes this process and the tools used to surface and evaluate issues. The first step in the anticipatory management process is to identify emerging issues that can affect the organization. Ian Wilson articulated the life cycle of an issue in four phases. He stated, "Without a proper business response, the societal expectations of today become the political issues (policy agenda) of tomorrow, legislated requirements (formalization) of the next day and the litigated penalties (control) the day after (1982, 5)." As shown in Figure 2, as the magnitude of the signals increase, organizational options narrow and organizational liabilities increase. Therefore, the earlier we can identify emerging issues, the more options we will have. There are a number of tools that may be used to identify emerging issues and where they are in their life cycle: scanning and monitoring processes, challenging assumptions, conducting issue vulnerability audits, and scenarios. A strategic intelligence system incorporates the tools of scanning, monitoring, and forecasting to gather and begin processing information about emerging trends and potential events. Scanning identifies signals of change, monitoring follows these signals, and forecasting estimates the duration, direction, acceleration, and amplitude of the signals. Trends are descriptions of social, technological, economic, environmental, or political (STEEP) movements over time. They define the context within which the organization will function in the future (e.g., the increase or decrease in households with incomes over $50,000). Events are developments that change the future when they occur (e.g., an oil embargo). Trends and events converge to form issues like environmental protection, product liability, energy availability and technostress. We are in the business of making money, not cars. Strict centralized financial controls are the secret to good administration. The American car market is isolated from the rest of the world. Foreign competition will not exceed 15% of the domestic market. Energy will always be abundant. Workers are expendable and do not have an impact on productivity. Cars are primarily symbols; styling is more important than quality to buyers who will trade up every other year. Managers should be promoted from within. The consumer movement does not represent the concerns of a significant portion of the American public. Success comes from having the resources to adopt others' innovations quickly. Although there was nothing inherently wrong with these assumptions, by the mid-seventies, they were beginning to lose their validity. The global environment was changing. After the 1973 oil embargo, gasoline prices escalated, Japanese automobiles invaded U.S. shores, consumer values shifted from style to quality, families shrank, workers' attitudes changed, and dealings with government required cooperation and acceptance of interference. It took General Motors twenty years and wrenching board action to reassess the validity of their worn-out assumptions. Another valuable issue identification tool that makes use of outside-in thinking is the issues vulnerability audit. The issues vulnerability audit, originally developed as a vulnerability analysis by SRI International in 1977, reveals subtle, overlooked opportunities or threats that fall outside the normal sphere of organizational activity. It lends itself to a kind of strategic thinking that forces managers to view trends through the eyes of both friendly and hostile stakeholders before the trends go critical. Organizations are similar to ocean oil rigs whose supports go deep into the sea to rest on the bedrock. The bedrock is society and the supports are what they need from society for their continuance. The issues vulnerability audit reviews these supports from the perspective of current strengths. The supports are turned into questions: What needs and wants does the organization meet? What resources does it rely on? What cost advantages are available? What special abilities does the organization require? What technologies underpin it? To really grasp a sense of how vulnerable the organization might be to outside forces that are less than friendly or even hostile, the vulnerability audit then examines the supports' vulnerability to removal, alteration, or substantial disruption. Vulnerabilities may result from competitive forces, governmental intervention, special interest group initiatives, scientific discoveries, or media disclosures. The results of the issues vulnerability audit further heightens the awareness of and sensitivity to external forces. These results can assist you to surface strategic issues before they become critical. Scenarios are possible paths to the future. More accurately, they are a hypothetical sequences of events constructed for the purpose of focusing attention on causal processes and decision points. Scenario development is a way to think about issues and their causal processes, the manner in which they might develop, what the impact on the industry and on the organization might be, and what action plans might be the most effective in dealing with them. The purpose of scenarios is to illuminate uncertainty. Scenarios help determine ramifications of an issues development along several alternative paths, and enable organizational leaders to examine its implications over time. Evaluating an issue requires a rich quantity of intelligence about possible issues that could influence the way the organization does business. An issue brief is a concise document that summarizes the issue for easy and comprehensive management consideration. In general, issue briefs are no longer than two single-spaced pages. They contain: (a) a statement of the focus of the issue; (b) a discussion of its background; (c) a description of the trends, driving forces, and stakeholders influencing it; (d) a forecast describing its future prospects; and (e) potential implications for the organization. Evaluating issues requires addressing critical questions: What is the probability that the issue will go critical? What is the probability that it will affect the organization? Can the organization influence the issue? Should the organization try to influence the issue? The prioritization process categorizes issues into three types: high priority, those requiring action (Category I); those that do not require immediate action due to their maturity, their inability to be managed, or their relative unimportance (Category II); and those requiring no action (Category III). Category I, high priority issues, are dealt with using a 10-step issue management process. 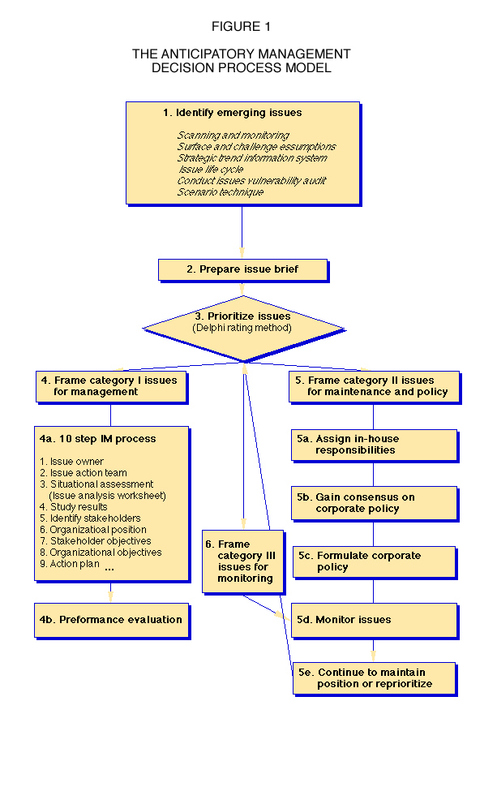 Category II issues are too mature in the issue life cycle to manage effectively but may require the framing of an organizational policy statement or action on the part of certain sectors of the organization. Category III issues require no current action but due to their potential impact on the organization may need to be monitored and periodically revisited. Performance evaluation is a review of how the action plan was implemented. It assesses how well objectives are attained and how stakeholders respond to the plan. Since the action teams disband once the plan is set in motion, performance evaluation is the responsibility of the office charged with anticipatory management function in the organization. This office may be called the issue management office, the public affairs office, or the strategic planning office. For Category II issues, the emphasis is not on external management and influence, but internal containment and compliance. Based on the issues' maturity or lack thereof, the organization cannot presently influence the issue. Nevertheless, the issue may require an internal structural or policy readjustment to align the organization with the direction the issue appears to be moving. Clearly, the 1992 Americans with Disabilities Act was not something that could be managed in 1992. Internal policies regarding hiring and architectural adjustments needed to be developed. Such adjustments generally require the involvement of several departments or divisions. Questions must be asked early on about which departments will be affected most, or who in the organization has the most information about the issue. Establishing policy on a mature issue, whose full impact is unclear, requires the best strategic thinking the organization can muster. This work should not be left entirely to the anticipatory management personnel but should include members from the departments most affected. At this point in the process, senior management knows that the issue will affect the organization. Reaching consensus on what, where, and how it will impact the organization requires linking "hard" and "soft" information vis-à-vis strategic thinking. Staff and members of impacted departments examine the dynamics of the issue from both the outside-in (finding trends, driving forces and stakeholders) and from the inside-out (linking those trends to the operations of the organization). In so doing, the group will identify information needs (e.g., positions within the industry and similarly affected industries). It is important to remember throughout this process that an issue may be in its emergent stage for one's own organization, but it may be much further progressed for another. Consequently, another organization may have considered the issue for a much longer period of time and have valuable information from which to draw. For example, when United Airlines confronted the video display terminal (VDT) issue, a review of companies outside the airline industry uncovered information that made policy formation much easier for United. Once the group completes its work, the appropriate course of action is apparent. At this time, it is important to identify further information needs and charge the anticipatory management staff with monitoring these needs. Because the future is unpredictable and issues do not always behave as expected, a manager must be able to move an issue into management mode easily. Shifts in the environment (e.g., changing social patterns; economic variables emerging that were not present when a policy was formulated; a new technology that makes the organization's position less tenable) could lead to a decision that the issue is now Category I. The shift may also be within the organization-a new strategic direction or new product introduction that makes the existing policy less valid. While category III issues may require no action, they should continue to be monitored for shifts that could affect the organization's future. If such shifts occur, the issues are re-evaluated and may be dropped or assigned a category I, high priority status. Understanding the movement of information through an organization goes beyond delineating the decision phases of the issues process. The accountability model diagrammed in Figure 3 shows the movement of strategic information from outside the organization to inside the organization via various accountability gates. Without such a road map, you may find yourself befuddled by an issue for which ample information already exists somewhere in the organization. A good example was Motorola and the potential neurological damage caused by cellular phones. In the late 1980s, Motorola had an enormous amount of information about the relationship between cellular phones and possible neurological damage. However, they did not use the information to manage the issue; an outside stakeholder presented the case for a positive link between the two and set the public debate. Motorola took a real bashing. Anticipatory management relies heavily on processes and responsibilities. Marrying the flow of strategic intelligence through an organization to the accountability for that intelligence is critical to the successful operation of the process. While emerging issues may be complicated and difficult to understand, the process by which issues are dealt with should not be. The use of the decision/process model in Figure 1 and the accountability flow chart shown in Figure 3 help you follow the flow of strategic intelligence and the accountability for that intelligence in the process of managing an issue. The structure should be kept simple. Management's time is at a premium. Although the overall process can have significant bottom-line potential, it need not be complicated, cumbersome, or intrusive on day-to-day operations. The steering committee is made up of senior managers selected by the CEO to screen and prioritize emerging issues presented by the AM staff. Individuals selected for this committee generally report directly to the CEO. These managers have continued growth and profitability as part of their job description, and they possess an in-depth knowledge of the organization, and an open mind to the external forces with influence on the organization. If an issue has been rated Category I, you should attempt to influence either its direction or its impact on the organization. Responsibility for resolving the issue must rest at the senior management level. To relegate responsibility to a lower level is to belittle the rating scheme and the organization's commitment. Once the steering committee determines an issue is a Category I, it assigns ownership for the issue by determining the department that could most benefit from or be hurt by the issue. The officer responsible for that department or unit is designated the owner. Ownership does not imply that work on the issue should be carried out exclusively within the owner's department. Establishing ownership is merely the first step in preparing Category I issues for management. While a senior manager may own the issue and be responsible to the CEO for its successful resolution, that manager may appoint someone else within his or her area as chair of the action team. The issues manager works with the chair to select the action team, set the agenda, and facilitate team meetings as necessary. Organizational leaders analyze the issue using a 10-Step IM methodology described earlier and more completely in Ashley and Morrison (1995, pp. 131-146). Should the steering committee classify the issue as Category IIthat is, an issue that does not require management by an action teamthe committee returns the issue to the anticipatory management function for policy formulation. Other departments may need to be involved so that the internal position is consistent with the issue's status. The monitoring activity for issues in Categories II and III concentrates on environmental shifts (these shifts might include, but not be limited to, changes in the direction of events, trends, and driving forces) and corporate shifts (these shifts might include, but not be limited to, changes in organizational policies, products, services, marketing strategies, or operating procedures) that could turn them into high priority, Category I issues needing analysis and management. Monitoring events and trends on a systematic basis insures that all necessary information will be evaluated. Issues monitoring should be responsibility of a separate issues management staff. If the issues manager determines that an issue needs to be reconsidered as Category I, the manager resubmits the issue to the steering committee in the form of an updated issue brief. At this stage, the steering committee reviews the action plan presented by the issue owner, including details of what is to be done, why it is to be done, who is to do it, when it is to be done, how much it will cost, and where the money will come from. Because many action plans involve cross-disciplinary work teams, it is crucial that all parties agree to it. The steering committee then forwards the plan to the CEO. The CEO is responsible for reviewing the action plan. The CEO will usually ask the issue owner and action team to present the plan at a steering committee meeting. Because the issue may not fully have crystallized, stakeholder positions, along with technical and operating objectives, should be presented to ensure everyone's involvement and commitment to the principals. When both the decision process and the accountability models are used together they assure the highest and best use of senior management time and provide maximum insurance that the organization is actively linked and proactive with its external world. The power of anticipation must be tapped if U.S. business is to succeed in the global arena that will be the battleground of the 21st Century. If you spend your time solving problems and resolving crises, you will have little time for innovation. The tendency to race headlong into the future while looking in the rearview mirror (how it was done in the past) and side windows (how the competition is doing it) has proven unproductive over the long haul. With foresight and anticipation, you will be more productive with the resources and assets you have at your disposal. Senge noted that today's managers have to shift their mind set from seeing themselves as separate from the world to seeing themselves as connected to the world, from seeing problems as caused by someone or something "out there," to seeing how their actions create not only problems but also opportunities. Anticipatory management techniques provide systematic and formal ways of understanding the world outside the organization. However, anticipatory management only becomes strategically significant when it penetrates your "inner world" of the manager, inside your mind where you make decisions. The human mind works by using accumulated experience to construct an internal model of the external reality. The tools of anticipation offer important additional information about the outside world. More significantly, they fundamentally alter perceptions, challenge prejudices, and open the your mind to new insights that were previously beyond your reach or blocked out by tightly-knit decision screens that we all have. It is fiscal folly to wait until an issue goes critical and then expect public affairs folks to contain it and public relations folks to explain it. Most people place heavy emphasis on an inside-out perspective; they are encouraged to take a narrow perspective on their area of responsibility. Metaphors and analogies abound in reinforcing this narrow perspective: keep your head down and charge, keep your nose to the grindstone, if it ain't broke don't fix it, stay out of other peoples sandboxes (or more correctly, in our present business environment, foxholes), to mention just a few. While change and uncertainty are inevitable, they need not be terminal. We cannot count on a natural evolution to a more predictable world. Success, and in some cases survival, require sophisticated intelligence systems. The pervasiveness and bottom-line significance of today's strategic issues demand that you use a systematic and formal way to recognize and manage these issues. Anticipatory management models, processes and tools help you to know what to do, who will do it, how, when it will be done, and what the outcome might be. William C. Ashley is an adjunct professor at Northwestern University and president of Ashley and Associates, 1942 Cheshire Lane, Wheaton, Illinois 60187. Telephone 1-630-668-3065; fax 1-630-653-4387; e-mail WCAshley@aol.com. James L. Morrison is editor of On the Horizon and editor of The Technology Source. He is a Microsoft Scholar and professor of educational leadership at the University of North Carolina, CB 3500 Peabody Hall, Chapel Hill, North Carolina 27599. E-mail morrison@unc.edu. This article draws from their book Anticipatory Management: 10 Power Tools for Achieving Excellence into the 21st Century (Issue Action Publications, 1995), which is available from Issue Action Publications, Inc., 207 Loudoun Street, S.E., Leesburg, VA 22075. All material within the HORIZON site, unless otherwise noted, may be distributed freely for educational purposes. If you do redistribute any of this material, it must retain this copyright notice and you must use appropriate citation including the URL. Also, we would appreciate your sending James L. Morrison a note as to how you are using it. HTML and design by Noel Fiser, ©2006. Page last modified: 8/2/2003 7:50:46 PM. 28851 visitors since February 2000.